Little stirs people to write as much as death’s approach. Some write wills and memoirs, others write verse and farewells. 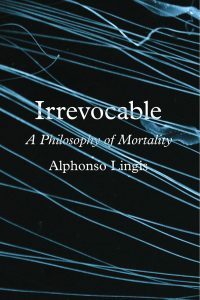 Alphonso Lingis, now eighty-three years old, wrote Irrevocable: A Philosophy of Mortality. In it, rather than providing yet another work of tame scholarship on the subject, he offers a remarkably intimate series of reflections on the process of dying that unite academic argumentation, anecdotes, and original photographs. For most of his academic career, Lingis worked at Pennsylvania State University. There, he wrote heavily on the history of philosophy, translated the works of noted phenomenologists including Emmanuel Levinas and Maurice Merleau-Ponty, and became somewhat well known for his writings on phenomenology, existentialism, and ethics. Many of the chapters in Irrevocable are derived from this earlier body of work, but in their placement alongside new material, they yield novel harmonies and tones. Unsurprisingly, given his past work, Lingis draws heavily on the oeuvres of Martin Heidegger and Friedrich Nietzsche throughout the book, though plenty of others—ranging from Gilles Deleuze to Henry David Thoreau—are cited. Yet the most captivating figures Lingis discusses aren’t professional philosophers or writers, but folks that Lingis has met while traveling. Lingis has traveled often since he was young and very often since his retirement. This practice has furnished him with fascinating stories to accompany his arguments and amuse his readers. For example, in the book Lingis recounts trips during which he talked at length with a mystic near a Hindu temple in India, watched strange Javanese and Balinese dances, and visited a small village in Indonesia where stillborn children are interred in palm trees. Likewise, he recounts vivid experiences of wandering within an Egyptian pyramid, an encounter with an extraordinary self-published book titled Aconcagua that recounts the scaling of an eponymous mountain in the Andes, and his attendance at the dramatic trial of a former Khmer Rouge official. There are other stories, too, which have an almost farcical quality—especially one involving repeated trips to Jakarta in an abortive attempt to secure a pet parrot featuring an unreliable-yet-endearing old man and an increasingly conciliatory police officer with a seemingly endless supply of pastries. As we walk, the fractal immensities of the forest efface the forest’s outer limits; its passing forms stroke us lightly … Our consciousness becomes a space where branches zigzag, arcs of light glint in the green, shadows pass without disturbing anything, unseen birds trill, insects drone and whisper. We move in step with the march of trees across the hill; through our bodies flows of air and blood and nutrients surge and subside in sync with the buoyant breezes and the pulse of sunbeams and shadows. We drift into nature; our self-programmed, self-motivating individuality dissolves in nature, into nature. Sporadically, Lingis sheds this style altogether. In one exasperated instance he writes, “My mind was reeling … Does the torture of one man restore the thousands whose torture and execution he managed? If God had tortured his only son, how has that changed the world he created, where millions continue to be oppressed and tortured and massacred?” And so, chapter by chapter, Lingis’s prose progresses, with different strange yet sonorous melodies and resonances, into a fugue that, while not entirely harmonious, becomes increasingly rich until, toward the end, the din gives way to a clearer recapitulation of its vital theme. When we contemplate the movement of the clouds, we find ourselves not in the heideggerian world of implements and objectives, pathways and obstacles, but in nature … there is a dissolution of any governing and integrating force in our consciousness and the systole and diastole of our consciousness disconnect to exist as pulses of luminous energy picking up movements of light, patches of shadow, restless leaves, bird calls, sparkles in the water … This experience is a premonition of dying. In this quasi-bucolic view, Lingis finds a sort of solace. He writes of his newfound understanding of death, “This destination no longer appears to us to be an inexorable fearful iron fate or supreme duty we owe to authenticity or to our freedom but the calm movement with which nature flows through time.” And so death, for Lingis, becomes not an end to the song of life, but a relapse into the rhythm of the natural order. Yet, this point as well as the rest of the book is not unsusceptible to criticism. During many of his tangents, Lingis relies too heavily on the coloring of his anecdotes rather than logic to make his points. Similarly, some of his arguments, while cogent, hinge on somewhat misleading redirections of emphasis. For example, Lingis’s alternative to Heidegger’s conception of death arguably relies on shifting the focus from the reality of death to the apprehension of dying. Furthermore, Lingis throughout the book engages in a sort of benign Orientalism—as if answers to life’s hardest questions could readily be found by trekking eastward and querying barefoot farmers, rather than, for instance, talking to a clerk at Walgreens. Lastly, many of the book’s chapters seem suspiciously superfluous (as if Lingis had shoehorned in whatever essays he had lying around in an attempt to clear his desk). All of these things, however, are excusable since these same attributes often contribute to the book’s appealingly singular character. More than anything else, Irrevocable provides something rare nowadays: it is a creature that’s not strictly academic, literary, nor autobiographical. Rather, it’s an odd, chimerical little volume. To read it is to listen to the heartbeat of a scholar who has read and written prolifically, watched the nameless dances of a moonlit tribesman, and thought deeply about what it means to live and die. Michael Shindler is a research fellow at the Consumer Choice Center and writer living in Washington, DC. His work has been published in outlets including The American Conservative, The American Spectator, National Review Online, and Providence Magazine. Follow him on Twitter: @MichaelShindler.